I’m always excited about a Spider-Man article. He’s the best. Can his life get any worse? Absolutely. 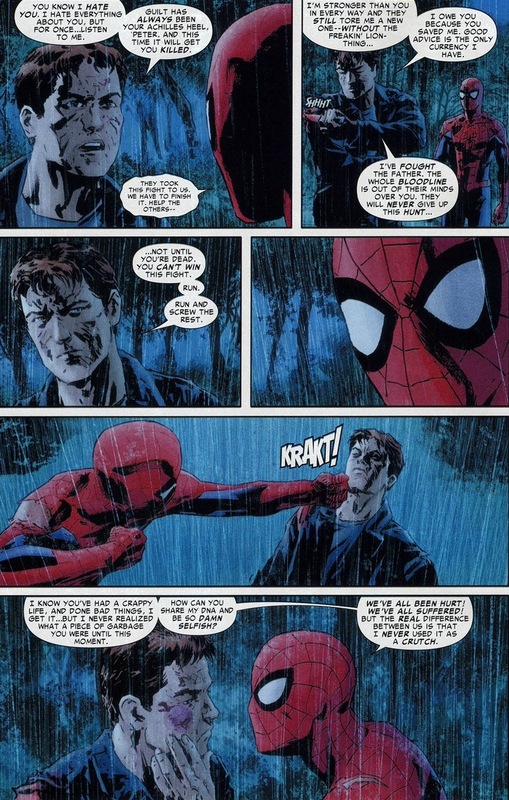 Do you know Kaine Parker? 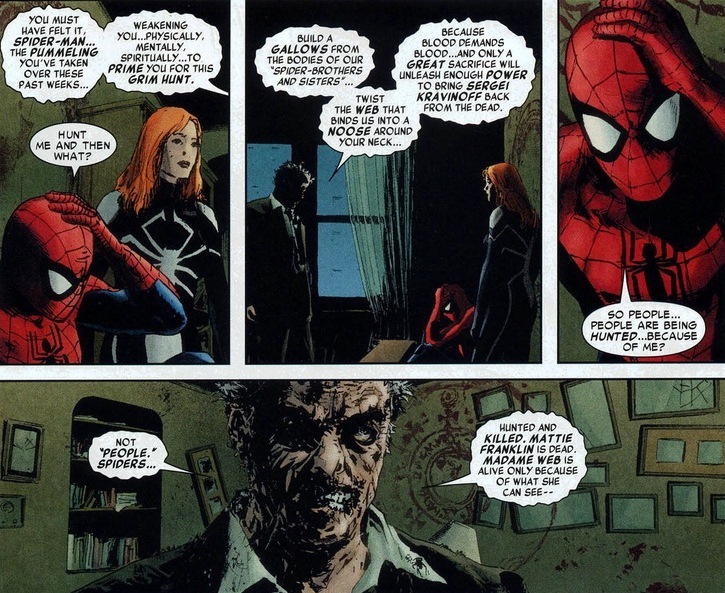 That bloody hobo is actually a clone of Peter created by the supervillain Jackal. Stronger, faster, acid powers, and also all that other cool spider stuff, he now lies defeated at the front door of Spider-Man’s apartment. Not a good omen. Today, we explore Amazing Spider-man #634-637, written by Joe Kelly and drawn by Michael Lark, Stefano Gaudiano, and Marco Checchetto. This arc Grim Hunt culminates as the finale to a five part series called Gauntlet where supervillain Kraven the Hunter’s family members unleashed depressing problem after depressing problem. Y’see, Spider-man’s easier to capture when he has low morale, a broken body, and swine flu. Now the Kravinoff family makes their move, striking at everyone who wears an arachnid on his or her chest. Peter will always hold a special place in our heart and we’ve just seen Kaine, but who’s the girl you ask? 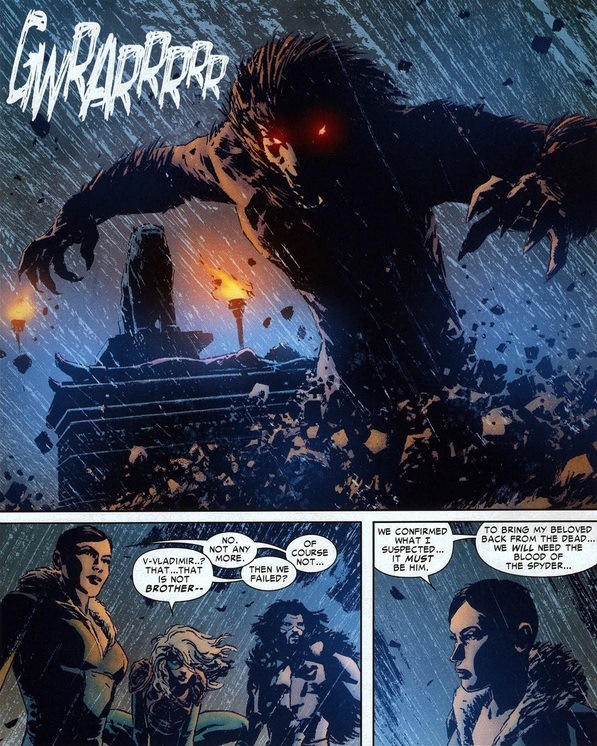 Meet Julia Carpenter, the former Spider-Woman and current Arachne. She’s a government agent, has psychic web powers, and part of the Spider family. Now you’re caught up. 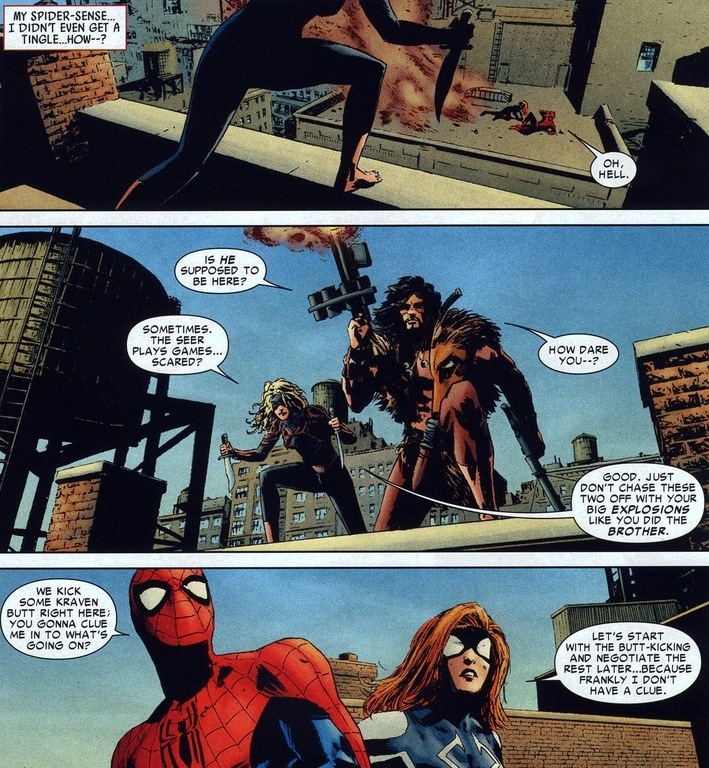 Look, from a logical standpoint, Spider-Man takes down these suckers no problem. They possess no superpowers, except maybe extra insulation from the cold in those exotic furs. But if you just look at every characters’ bench-press and 100 yard dash scores, then Batman would be a smear on the Gotham sidewalk the first month he flew around in a bat costume. Y’see, just like the Dark Knight, the Kravens have that superpower of over-preparation. You can’t beat them if they already have every counter-tactic covered. As you can tell, we get thrown a crapload of foreshadowing. Everyone’s raving about something exciting/dangerous coming up and Spider-Man better be ready or else. 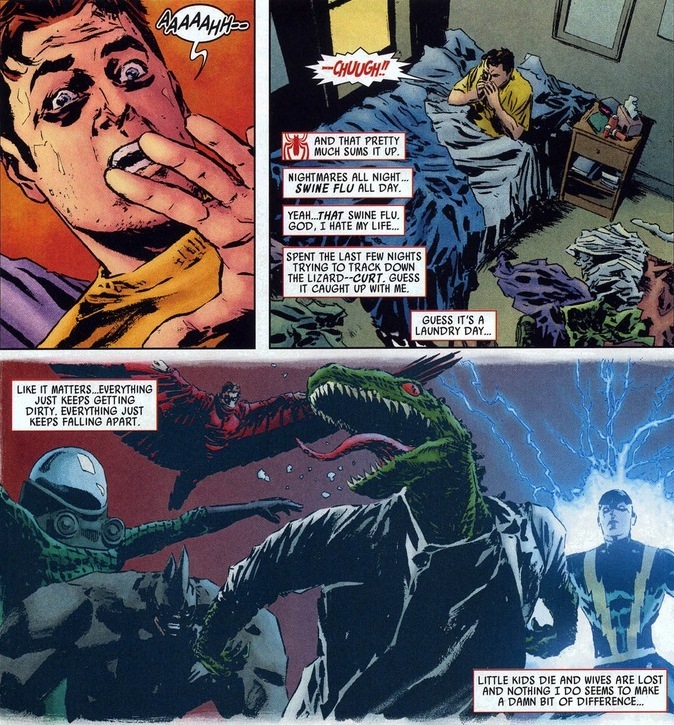 More importantly, the hunters know Peter’s biggest weakness: overwhelming guilt about everything. Uncle Ben’s a double-edged sword. 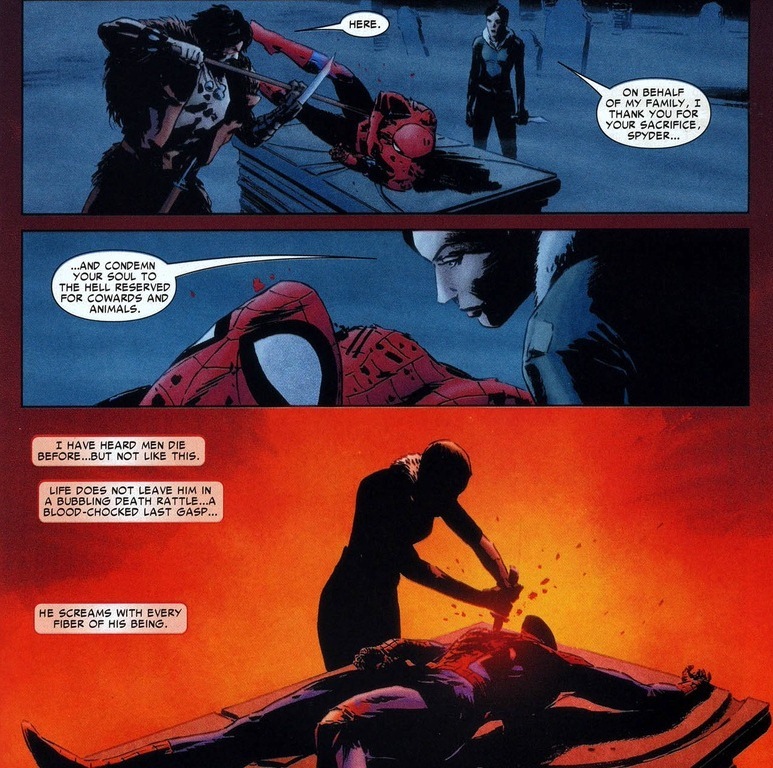 His death showed Spider-Man the error of his ways and created the world-saving superhero’s steadfast morality and compassion. On the other hand, whenever Peter screws up or has someone kick it because of something indirectly related to him, the emotional turmoil will totally wreck his judgement calls and fighting spirit. 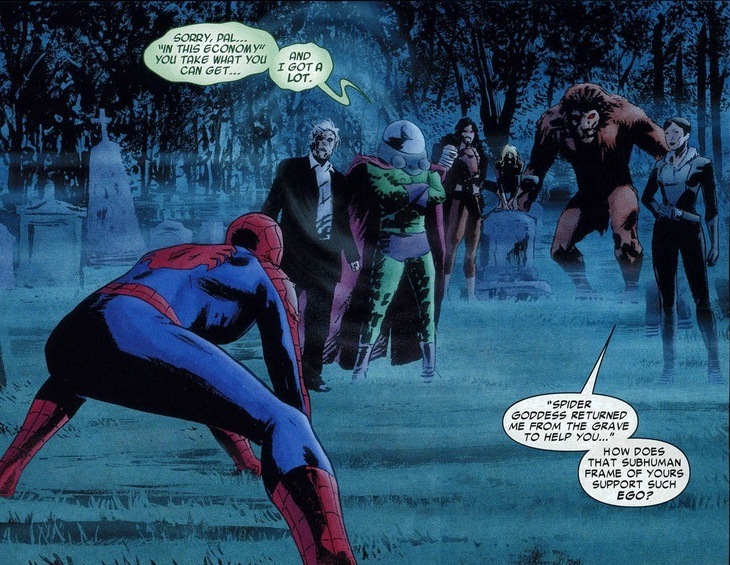 Like when he decides to go to an abandoned graveyard to take on all the Kravens at once. Why will this go badly? Duh, because he can’t win fighting like a man – he can only overcome his predators by succumbing to his spider side or something equally spiritual. 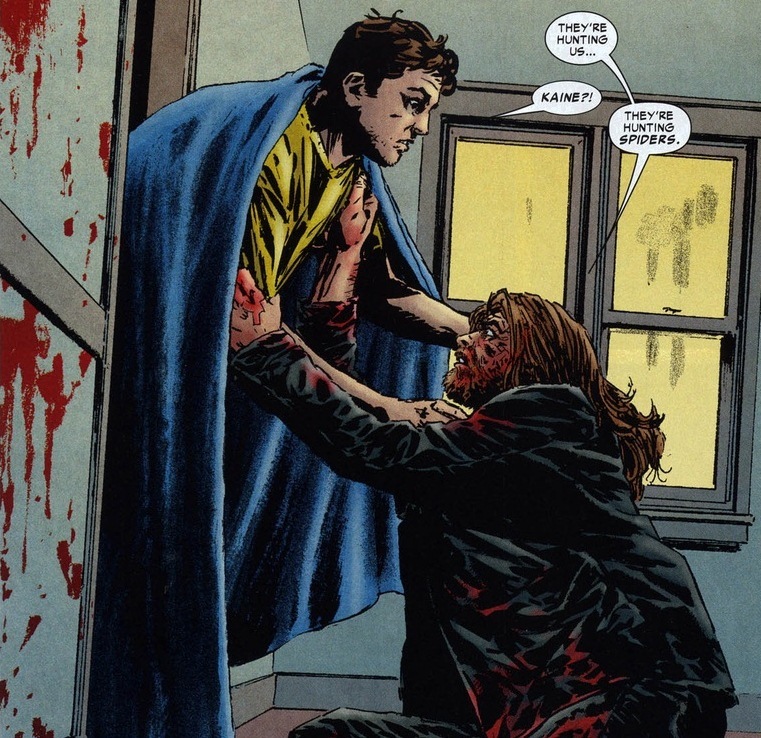 Though first Kaine shows up all cleaned up as the little devil on Peter’s shoulder. Foreshadowing! Also, I hope you understand Spider-Man really ain’t exactly a terrific fighter if there isn’t some skyscraper he could web onto. Especially when his opponents are a family of crazy people and their giant undead dog. 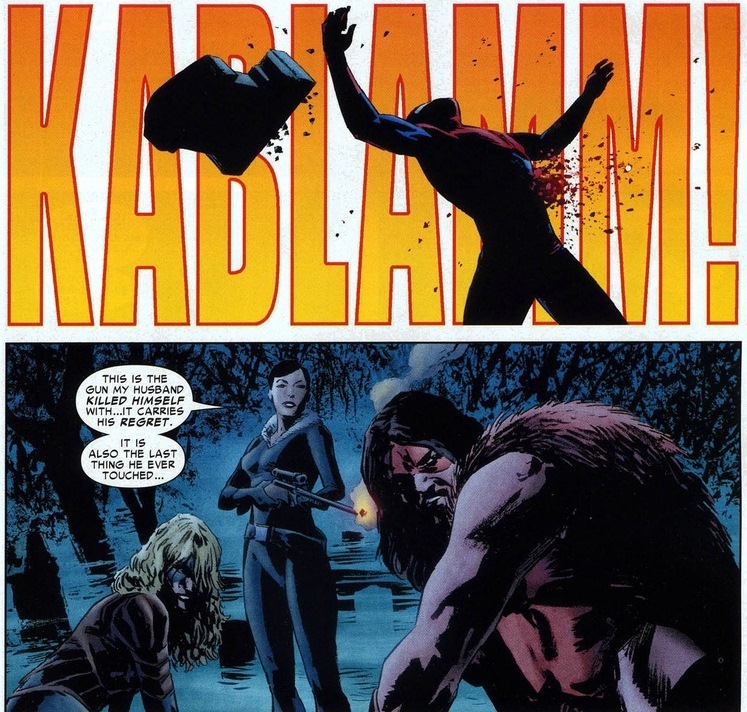 Oh, I didn’t really mention that Kraven the Hunter happened to be deceased, did I? 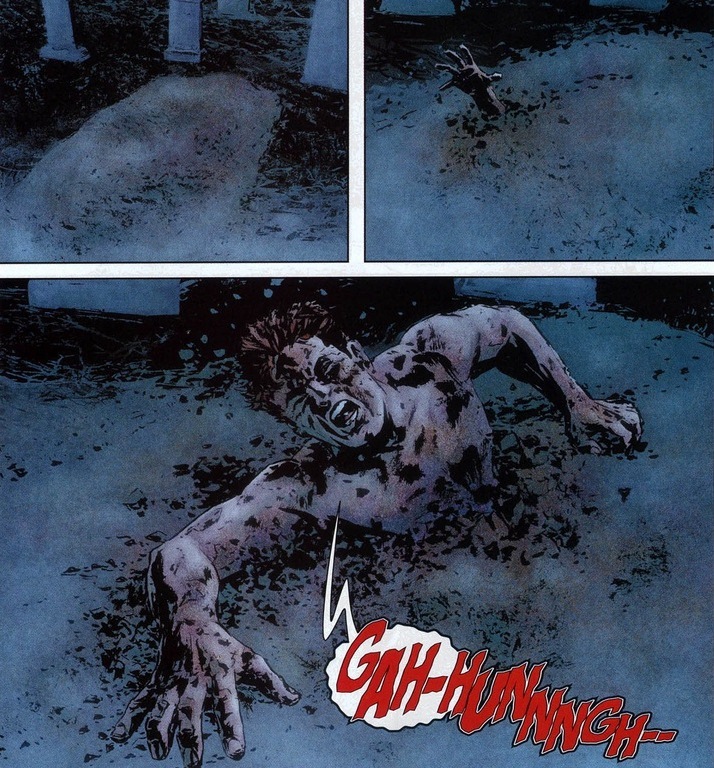 Go read the Kraven’s Last Hunt arc, a super famous, well-written gem back in 1987. 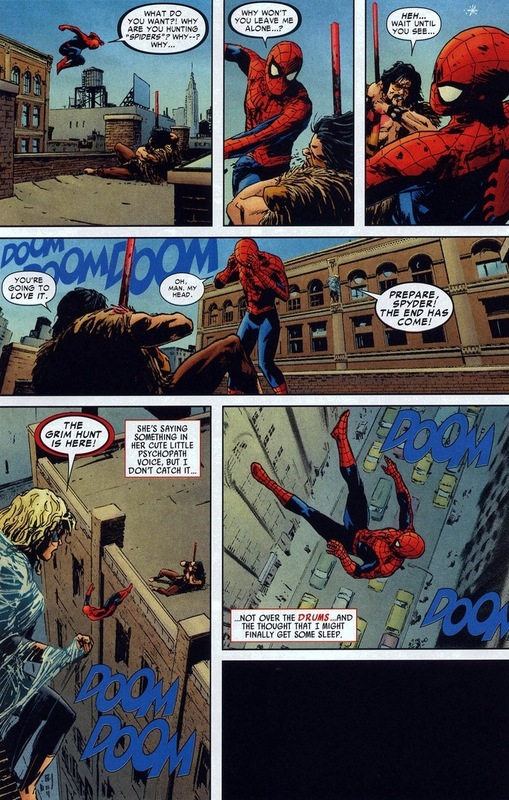 After seemingly killing Spider-Man, Kraven besmirches the superhero’s name and then finally commits suicide. Not anymore, I guess. Though I would be far more confused than triumphant if I had to burst out from a grave, but to be fair, I’m also not a deranged supervillain. 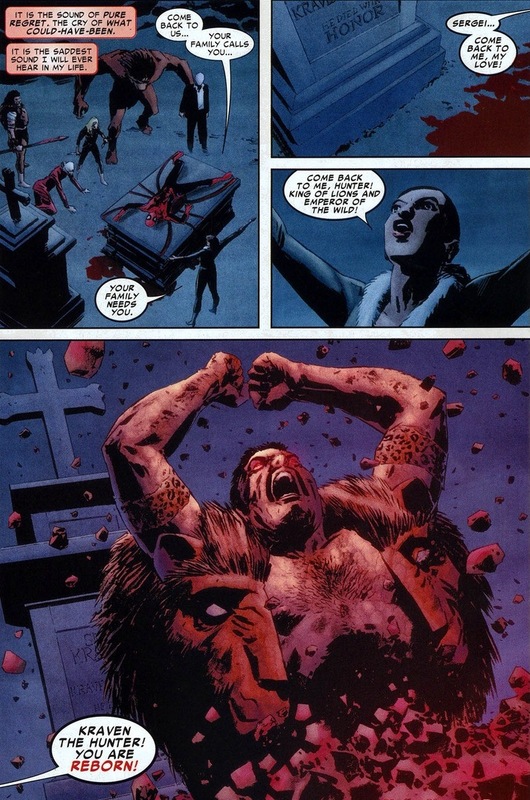 With life returned to dear Kraven, how shocking that he might not be terribly happy about his ressurection after purposely shooting himself to death totally content and satisfied in his life’s accomplishments. Oh, and that magic spider-killing-bring-dudes-back-to-life spell? Totally cursed. 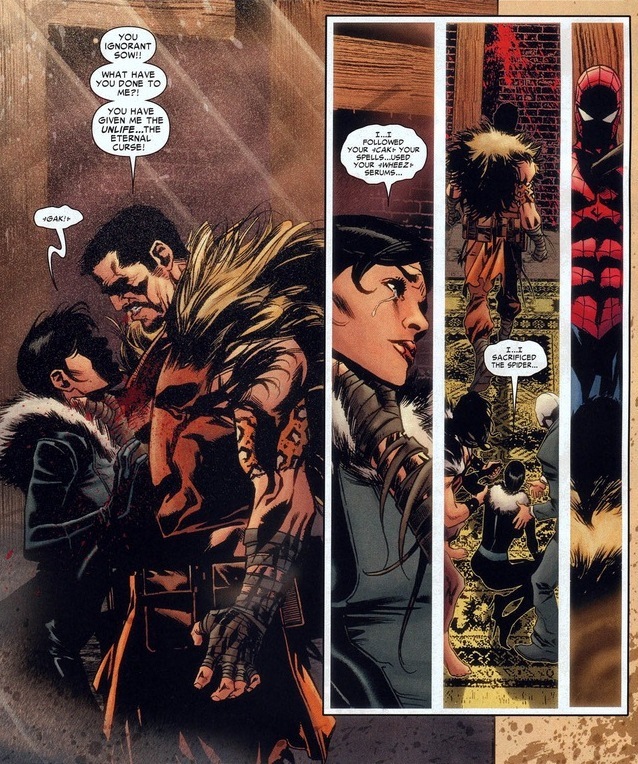 Yup, Spider-Man hangs up dead on the wall next to Kraven’s prized water buffalo and closet full of animal fur vests. I’m not messing with you, I promise. 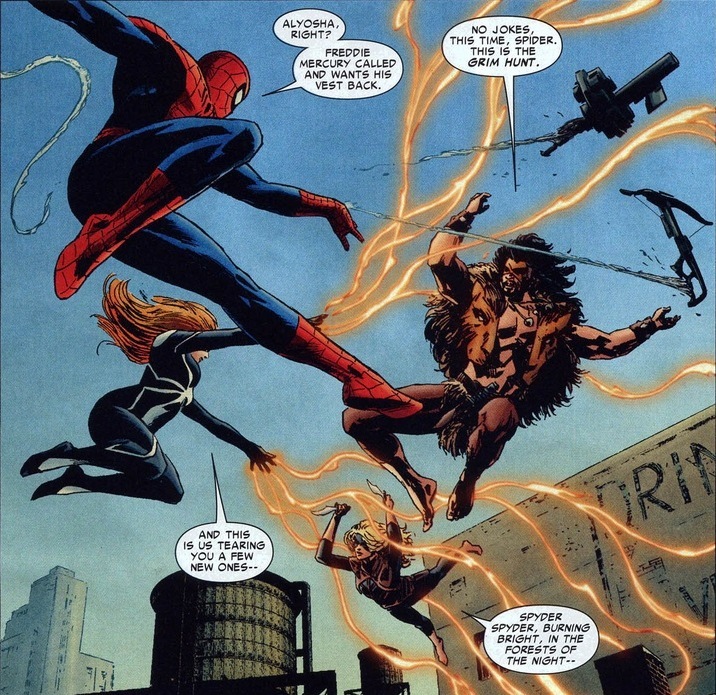 Peter Parker died on that stone tablet bringing Kraven the Hunter back to life. The end.